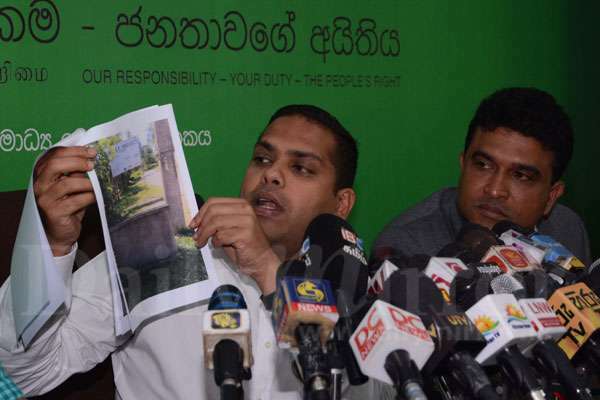 Making counter allegations against investor Anton Deshapriya, who had recently accused a state minister of soliciting a bribe, the United National Party (UNP) yesterday called for a thorough investigation on the investor. 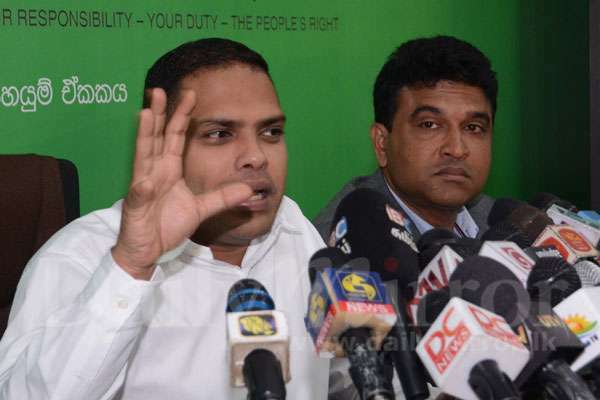 UNP Spokesman and Minister, Harin Fernando told a media briefing that there was an invisible hand behind this episode. “Some mischievous elements appear to have urged this investor to make allegations against the ministers. This is a move to sling mud at the government and as such we call for investigations both locally and in Italy with the support of Interpol,” he said. State Minister Sujeewa Senasinghe who made counter allegation against Mr. Deshapriya said he had received death threats from the investor and that he had received the last death threat over the phone on October 17, the day he had a news conference at the ministry. He revealed that this businessman, living in Italy, had defaulted several banks and that his name was included in the CRIB. The state minister who appeared to be emotionally shaken up said he was going through a difficult time after the allegations were made by Mr. Deshapriya with family member’s relatives and friends calling him to inquire about what was happening. “I could not even talk to my mother for some time after the reports published in the media,” he said and added that he would propose re-introducing criminal defamation laws to stop people making false allegations. Deputy Minister of Law and Order, Nalin Bandara Jayamaha said he too was threatened by the same person some time ago. Mr. Bandara showed pictures of the so called office of this investor in Sri Lanka and some of his photographs. So, you proceeded this far with a defaulter who is in the CRIB. Sometimes it’s better to keep your mouth shut and be thought a fool than open your mouth and remove all doubt. Actually the issue is the investor/s have been requested to prove from where the money is from and the delay with the project. Good to investigate. Of course, we all believe you and our compliments to your dear mother for raising such miracle of a son. While it is common among Sri Lankan politicians to accept bribes (and this is the truth whether the people of Sri Lanka like it or not), but one must think how on earth an individual (especially a Sri Lankan) residing in Italy have financial strength to invest in a such humongous project? Obviously this whole episode seems very suspicious. Anyways this us nothing new in this BANANA REPUBLIC!!!. Good that he has explained it or else the people were starting to believe the allegation. Ha ha, Poor State Minister. Such a babe. If you analyze the photos, what they say doesn't quite jive with their hand signals. While notifying how an Italian businessman has accused (them) a state minister of soliciting a bribe, the hand signals seems to indicate how the bribe has slipped right through their fingertips. God only knows what's going on .But usually bribes are very much common among so called politicians and officials.Wonder of Asia. ok what you say to be proven. first get the local address given in this investors application. Let the public know it as well. Secondly his local counter part detail. Be transparent as much as you can. Thirdly get Sri Lankan foreign ministry and Interpol to get back ground check of this investor. Publish all information may clear at least 50% of everyone's dought. Rest let the public decide.